Yes! Yes to Tomatoes in fact. This was one of the first brands to really take my interest when I first took the unreturning jump onto the skincare wagon. I unwittingly thought that this brand was nowhere to be seen in UK waters, I know better now. Yes to ranges can be purchased from Boots, BeautyBay, Asos and LoveLula. I realise now, that I can't actually move for the stuff. 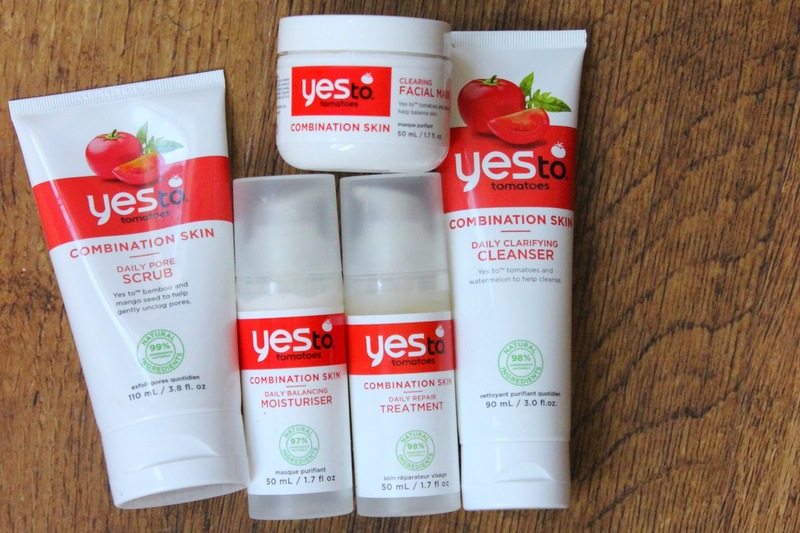 Yes to Tomatoes is that one you want if you're fighting with blemishes, blackheads and/or oil control. Harnessing the powers of, you got it, the tomato (lycopene), the pull of this range is using powerful anti-oxidants to help fight free-radicals and restore pH balance. Okay, so does it work? Short answer... Yes to some of it does! Okay, so I love the sensation of exfoliating. Put that in a formula that's gentle enough to use daily and I've found myself a match made in sweet grounded mango seed heaven. Swoon. This product is designed to target blemishes, reduce blackheads and unclog pores. It also does a neat little trick of reducing redness. I use this daily, towards the end of the evening as one of those take-the-day-off systems. I can really feel it slough off all those dead skin cells, excess oils and dirt from the day gone by. I take a 50 pence piece sized amount into my palm and very softly massage it into my skin applying almost absolutely zero pressure. Focusing primarily on my cheeks, nose and forehead, I notice afterwards than any foreign bodies camped up in my pores have been eliminated. While unfortunately I did not notice a reduction in blackheads, it is a very powerful product for clearing and renewing the skin. It gives a very solid clarified sensation without any stripping, drying or *cringe* squeaky feeling. It also helps to even out my skin tone. After use I don't feel like I'm red in all the wrong places. The exfoliating factor in this product is finely ground mango seeds. And boy are they finely ground. They are almost indistinguishable, which, I suppose, is what makes them gentle enough for daily use. They don't come in short supply either, there's absolutely thousands of these little grains waiting to kick out any muck from your pores. This is my favourite. Trumps all else. You know by now my position on face masks (I just don't understand them! ), but this is something I can really get into bed with. Stating it will refine and purify pores, absorb sebum, and clear skin, you can forget all that, this product is for balancing your face and when timed correctly, you'll get some simply wonderful results. It smells exactly like the Daily Balancing Moisturiser, so I'm more than happy to let this sit on my skin for 5-10 minutes. It is a very thick and hard mask. One that feels heavy when you scoop it out of the pot, and will really solidify when you place it on your face. I use this mask whenever I have a long day ahead of me when I don't have the luxury to blot or fix, as this mask keeps my skin completely balanced for the entire day. Thank you Yes to! That doesn't mean I use it every day, I couldn't do that, my face would weep. I just save it for those important days. Designed to reduce blemishes and acne, this product went down really well with me. It answered everything that was wrong with Lush's Grease Lightning (review here). It was effective, light, absorbent and completely gentle. While it doesn't work quite as quickly as Grease Lightning at removing blemishes, it does reduce redness in due course. As mentioned previously, I only get heavy subsurface blemishes along my neck and jawline, and within one week those were very much disappeared. The product sinks in instantaneously and does not leave a single trace. It's perfect for my sensitive skin, I was scared it wasn't going to kick in as I couldn't even feel its presence. I apply it all along my neck and jawline twice daily and find that it is perfect at keeping any blemishes at bay and reducing inflamation. Now, a downfall with this product is that it's actually aimed at Combination Skin (not the products fault, my face's fault, probably). Meaning, that this moisturiser isn't quite well equipped to deal with everything oily skin brings. Which is mostly just yucky oil. While it is a little heavier than I would have liked, it isn't without its positives. This product is one of my favourite smells. Not sure what it even is? But it definitely isn't tomato. In fact, nothing in this range even smells remotely of tomato, or the same as each other. But this is sweet bliss, making it a pleasure to apply. It certainly does keep my skin well moisturised, not in a way that makes it pump out oil, but in a way that makes it feel hydrated. I apply it and my skin will feel silky soft. It's got a very good spread and a wonderful finish. The feel of this product is just perfect. I find that pushing the pump dispenser only half way down gives me more than enough product to cover my face and neck. It will leave me looking and feeling very refreshed and awake after use and while it can't quite control my oil enough throughout the day, it really does feel wonderful to use. Now this, this is actually the only product in the entire range that was a big miss for me. It smells super chemical, while it is 98% natural it does contain alcohol, mild surfactants (lauryl glucoside) and preservatives (Sodium Benzoate / Potassium Sorbate). While it isn't my aim to induce fear, these are the qualifying ingredients that turn me away from the product. It is a translucent gel cleanser, which is a really very runny product. As mentioned, it does contain mild surfactants so it does foam slightly. Not enough that it becomes stripping, but enough that it makes me uncomfortable. This product does offer a nice clean feeling, but it doesn't aid much in the way of skin benefits. I find that it isn't quite nourishing or healthy to skin. Instead, it just does its job of remove dirt and cleaning your skin. Which is fine. But it isn't enough.